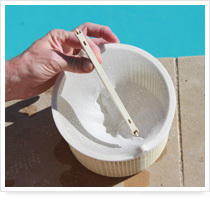 Net’Skim® an easy- to-use, indispensable pool and spa accessory that simplifies maintenance and saves you money. 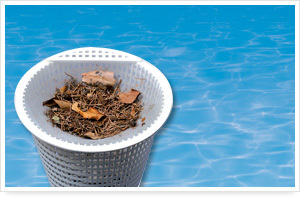 Net’Skim® is a pre-filter used on all basket skimmers up to 24cm in diameter, with or without handles. It retains dirt and rubbish (leaves, twigs, insects, etc.) which accumulate on the water surface. It simplifies the tedious job of cleaning the basket and protects the pomp. Its patented double fixture system: fastener and elastic, plus specialized netting of 250-300 microns guarantee optimal results. As Net’Skim® has much finer netting than the basket skimmer, more particles are retained so the main filter is not solicited as ften. Further, far less chlorine and other chemical products are needed as levels of dirt and rubbish become minimal. Net’Skim® is both ecological and economical. Net’Skim® comes in boxes of 12 for easy stocking. Refill packs of 16 boxes. 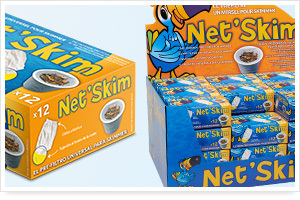 Why should I use Net’skim® when there is already a basket in each skimmer? The skimmer basket is not much more than a sieve whose holes let through a large part of the rubbish that floats on the water’s surface (pine needles, leaves, twigs, insects, pollen, hair, etc.). A build-up of this litter in the main filter can cause it to work inefficiently and even damage the pump irreversibly. While enabling an easy and regular evacuation, the Net’Skim pre-filter stops debris up to 250-300 microns thus guaranteeing your pool stays clean and your filter remains protected. What types of baskets can I use Net’Skim® on? 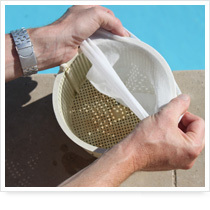 The Net’Skim® pre-filter was created to be easily placed on and removed from all types of baskets (skimmer baskets and pump baskets), with or without handles, up to 24cms – whatever the make or model of your pool. If the handle is removable, take it off before putting the pre-filter in place, and then, replace the handle. If the handle is attached permanently, place the pre-filter over the handle – this won’t affect the efficiency of Net’Skim®. What is the purpose of the fastener for the bottom of the basket? When the pump is stopped, the water is no longer drawn in and therefore has a tendency to back up into your pool. The fastener ensures that the pre-filter remains attached to the bottom of the basket thus preventing the caught up waste materials from being expulsed back into the pool. How long does a Net’Skim® pre-filter last and can it be washed out? Using a Net’Skim® pre-filter guarantees the cleanliness and perfect hygiene of your pool for 10 to 15 days in accordance with the pool environment and the frequency of use. After this time period, the netting of the pre-filter could become obstructed thus reducing its efficiency. It is advisable to check the quantity of build-up in the pre-filter every now and again and to change it before it becomes completely plugged. We strongly advised against washing out the pre-filter as this considerably reduces its ability to filter correctly. However, to prolong the life of your pre-filter, removing any accumulated larger bits of litter (pine needles, leaves, etc. after high winds for example) is suggested. In the end though, build-up from impurities and pollution do plug the netting and prevent adequate filtering. 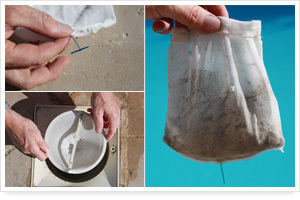 The filter must be changed to ensure the water in your pool remains clean and pure. How does Net’Skim® help me save money? The chemical reaction between the dirt in a pool and the cleaning products used to clean it (chlorine, bromine, PHMB …) causes it to break down and transform into fine, biologically inert particles. These chemical reactions use up cleaning products in direct relation to the amount of impurities in the water. By enabling you to easily evacuate the larger bits of rubbish regularly, instead of having them gather and stagnate in the main filter, the Net’Skim® pre-filter obviously helps you to reduce considerably the amount of cleaning products needed all while increasing the cleanliness and purity of the water. Furthermore, the circulation of great amounts of water, which is then evacuated straight into the sewer system (1 to 2 meters cube), is necessary each time you clean out the main filters (sand, diatomic, cartridge, cloth sheathes, etc). By preventing the clogging up of the main filter, Net’Skim* enables you to space out the need for backwashing, which in itself saves you a considerable sum of money in water, while conserving perfect water quality and hygiene. How does Net’Skim® help protect the pump and space out backwashing? The main filter (sand, diatomic, cartridge, cloth sheathes, etc) is situated after the pump in the filtration circuit. Therefore, the dirt and impurities present in the water of your pool systematically pass by the pump which draws it in to send it on to the filter. An accumulation of large waste materials (notably pine needles and twigs) can end up blocking the mechanism in the pump and causing irreversible damage. The Net’Skim® pre-filter prevents the larger bits of rubbish from going beyond the skimmer basket of your pool so your pump is preserved efficiently and its life expectancy is increased. Several retailers and after-sales service companies have informed us that after each service call on a defective pump, they deliver a box of Net’Skim* pre-filters when returning the repaired pump. Their clients are greatly appreciative. 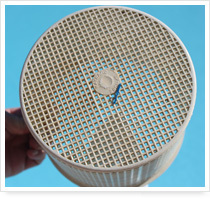 As the pre-filter enables you to evacuate the larger waste materials on a regular basis; as it prevents clogging of the main filter; as it protects the pump by increasing the efficiency of maintenance products, the Net’Skim pre-filter spaces out considerably the need to maintain and clean your pool. With great efficiency and little cost, the Net’Skim® pre-filter is an indispensable pool accessory to guarantee clear, pure water while ensuring your pool becomes more than ever a source of relaxation and pleasure. Why does a Net’Skim® pre-filter improve water quality? The rubbish that falls onto the surface of the water (pine needles, insects, vegetation, pollen, hair, etc.) is drawn into the pump and becomes blocked in the filtration system (sand filters, diatomic filters, cartridge filters, cloth sheath filters, etc.) where it is broken down by the chemical products used to clean the pool. 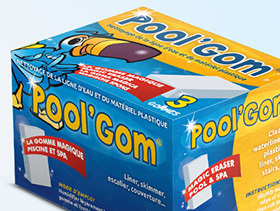 This waste material is transformed into fine, biologically inert particles which are then returned to the pool causing murky water and clogging the pool. The use of a Net’Skim® pre-filter allows you to clean out the larger rubbish on a regular basis before it is broken down by chemical cleaning products, thus reducing their consumption and improving the cleanliness of the pool and the quality of the water. Can a Net’Skim® contribute to children’s safety ? When placed in the basket skimmer, chlorine tabs and solid disinfecting products (generally corrosive and toxic) are within a child’s reach. Once in place, a Net’Skim° pre-filter hides the solid chemical products and they are no longer easily accessible to young children. Although not the original intention of a Net’Skim° pre-filter, it’s obvious that it also contributes to the security of our children. What proves that it works? Patented in 1998 and marketed since 1999, in France and throughout Europe, Net’Skim® pre-filter boasts an incontestable success not only by private pool owners but also by our professional clients who manage hotels, campgrounds, or resorts, for example and who insist on providing top quality water and hygiene in their pools which are destined to accommodate the public. 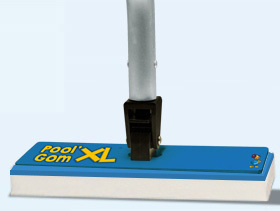 Just like thousands of other pool owners who have been seduced by the Net’Skim° pre-filter, adopt this indispensable pool accessory of little cost and discover a simple and immediate resolution to your filtration problems. Thanks to the fastener, dirt and other waste materials are prevented from going back into the pool when the pomp is stopped. 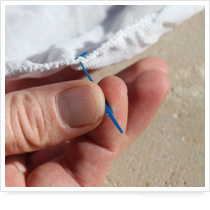 Pinch the T-shaped fastener to easily insert it into the basket meshing. Insert the fastener on the bottom of the basket. Put the chlorine tab in the bottom of the basket BEFORE stretching the elastic on Net’Skim® around its top edge. 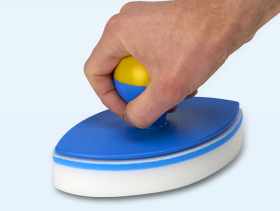 Reattach the handle and insert the basket, fitted out with Net’Skim®, into the skimmer.